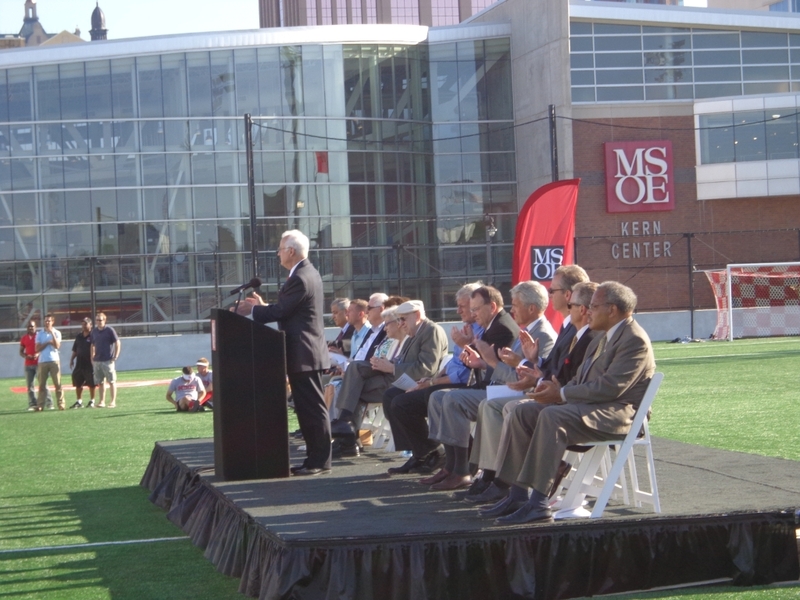 The Milwaukee School of Engineering’s Kern Center and recently opened Pamela and Hermann Viets Field were funded in part through donations by Robert and Patricia Kern. Photo by Michael Horne. Look out, Lynde and Harry Bradley Foundation — there’s a new player in town which may beat your assets. The Waukesha-based Kern Family Foundation reported 2012 assets of $627 million, up from $583 million the year before and just $13 million shy of the assets of the much better known Bradley Foundation. This would make the Kern Foundation the state’s second largest, if you exclude the $711 million Greater Milwaukee Foundation, which is essentially the administrator for a consortium of foundations. The Kern Foundation is nearly six times larger than the Northwestern Mutual Foundation, the next largest in the state. The Kern Foundation is also second to Bradley in grants paid, with $27 million in calendar year 2012, the most recent year for which information is available. During that period, the Bradley Foundation made charitable disbursements of $34 million. Both organizations share interests in conservative policies, with the Bradley being more political and secular, while the Kern tends toward the social and religious. [See: “About the Kern Family Foundation Activities,” below.] They have cross-pollinated in other ways, as will be seen. In the volatile world of high-dollar charitable foundations, many variables can affect year-to-year assets, most notably investment returns. The Kern Foundation’s assets have ranged as low as $268 million in the recession year of 2009 to the 2012 high. Its 2011 assets of $583 million were actually $5 million greater than those of the Bradley Foundation that year. The Kern Foundation employs some sophisticated investment strategies, including the creation of a Cayman Islands subsidiary. Not too many foundations get into off-shore accounts. It paid some $813,000 for investment advice to five companies in 2012, including $224,197 to Fiduciary Management Co., Inc. of Milwaukee. Fiduciary founder and CEO Ted D. Kellner, like Robert Kern, has been a member of the MSOE Board of Regents. Dr. Hermann Viets, the President of MSOE, serves on the Kern Foundation board with an annual stipend of $1,500 per year. Other board members include its treasurer Michael W. Senske, who also serves on staff as the Chief Financial Officer, at a salary of $179,327 per year. Marcia Peterson and Debrah Kerr serve on the board without salary, while William H. “Chip” Mellor and Dawn Tabat each receive $2,000 per year. Mellor, the President and General Council of the Institute for Justice based in Arlington, Virginia, (“Join the Fight for Liberty Today!”) was one of four 2012 Bradley Prize recipients. The award came with a $250,000 stipend. Tabat, the board member with a palindromic surname, is the Chief Operations Officer of Generac. Atty. Richard Graber, former state Republican Party Chair and former US ambassador to the Czech Republic, receives $1,000 per year for his input. The foundation’s staff, besides Senske, includes James Rahn, a Director and President, who receives $332,727 per year for his services, while Program Directors including Karen Wilken, Ryan Olson, Fredrick Oaks, Greg Forster and Kyle Bode receive between $89,423 and $124,908. These are nice, handsome salaries, but a bit shy of those offered by the Bradley Foundation, where Chairman Mike Grebe makes $481,000 per year. But then again, Grebe has to deal with a board of directors that includes George F. Will, and that cannot possibly be fun. The Kern Foundation uses an address which appears to be the Waukesha residence of the Kerns themselves. It is not certain if the staff and directors do business from the couple’s kitchen table — but that’s where they wrote out those employee bonus checks, so who can say. Now, would you like to get on the receiving end of the foundation’s largesse? You’re on your own. The foundation’s website notes in bold, capital letters: UNSOLICITED PROPOSALS ARE NOT ACCEPTED. The Foundation “invests in the recruitment, selection, training, placement, and support of a new generation of principals.” It provided a $1 million loan to New Leaders for New Schools, a national group with a significant Milwaukee presence. The loan, at 2 percent annual interest, was to support a principal training program. The focus of KEEN is described as “Instilling the Entrepreneurial Mindset in Engineering Undergraduates.” Its mission is “to graduate engineers who will contribute to business success, and in doing so, transform the American workforce.” The foundation has been a major supporter of the Milwaukee School of Engineering. “The predominant mission of the Foundation in this program is to equip pastors with an understanding of the intersection of faith, work, and economics, and to empower them to lead their congregations in active application of this knowledge.” The foundation spent $289,203 on two conferences for 210 grantees and nearly $50,000 for a Pastoral Ministry Program in addition to millions of dollars granted to hundreds of Protestant theological schools and programs nationwide. The list takes up pages of fine print in the foundation’s tax return, and is there for your edification, should you have time on your hands.